Cows in Jersey, UK gives pink milk due to the orange carrots diet it had. 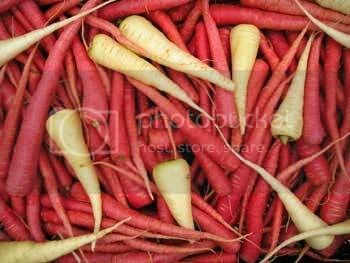 A farmer whose cows produced pink milk after eating carrots solved the problem by feeding them white carrots instead. Peter Houguez was so surprised by the way the milk was affected he called in a vet, who was just as puzzled until he realised the problem began when orange carrots were added to the cows' diet of grass and hay. Two things I never heard before pink milk and white carrots, but this is what the story talks about. Mr. Houguez of Jersey Islands in UK, saw his cow give pink colored milk. He discussed with his Veterinary doctor who found what was causing the cows to give pink milk. It was due to the orange carrots which the cows loved very much to have it along with the grass diet. So, Houguez had to go to France to get these white colored carrots in order to turn the milk into white color again. 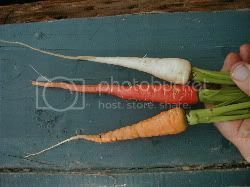 Luckily the cows didn't notice the difference in the colors of the carrots, they taste the same. Mr. Ian Johnson, National Farmer's Union, said that this Pink milk is not harmful is as good as white milk and is probably healthier with the nutrients found in the vegetables. The problem is solved now. Have you heard of Pink milk and colored carrots before? 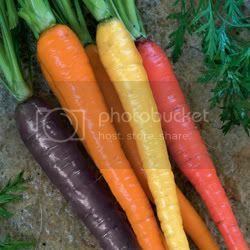 I found some colored carrots on the net for those who haven't seen. I will stay with orange carrots for now.